UPDATE: According to a Facebook post by her mother, Selina has passed away. Our thoughts go out to her family at this difficult time. It has been a tough year for the Oehmen family. On February 28th, 10 year old Selina was told she had DIPG, a highly aggressive and difficult to treat brain tumor found at the base of the brain. On March 5th, her tumor hemorrhaged and she went into a coma like state. Since that time, Selina has been unable to speak. Her tumor has also increased. 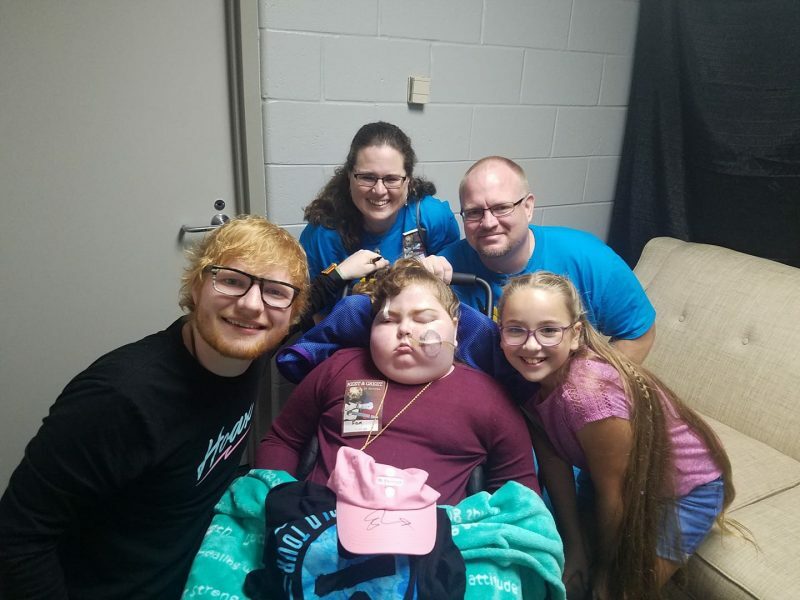 Through it all, Ed Sheeran’s music has meant a great deal to both Selina and her family. Sheeran has been a part of each radiation treatment, chemo session, and surgical procedure. 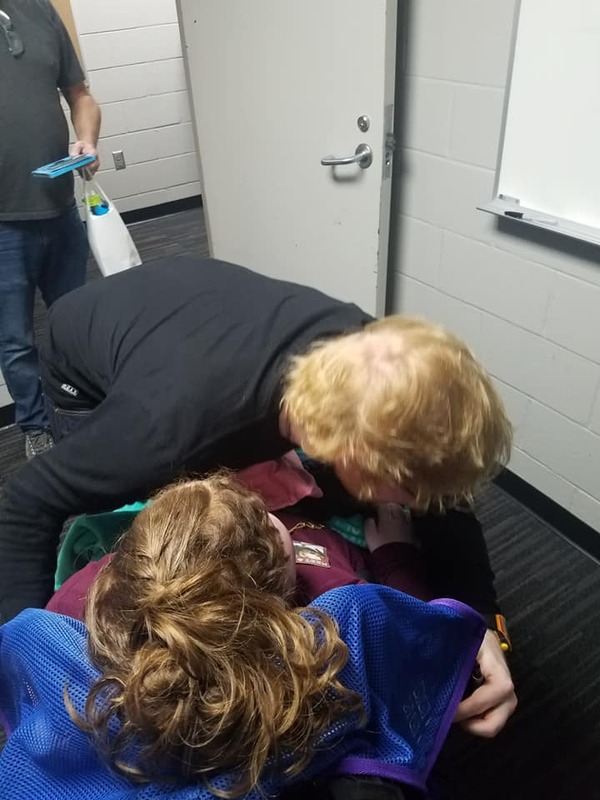 On Friday night, before his performance at Gillette Stadium, she got her wish to meet the man that has meant so much to her during this difficult time. The Oehmen family purchased tickets to the performance once they found out he was performing in the area. Fun 107 supplied the backstage passes to make it an even more memorable evening. The rest was in Sheeran’s hands and he didn’t disappoint. 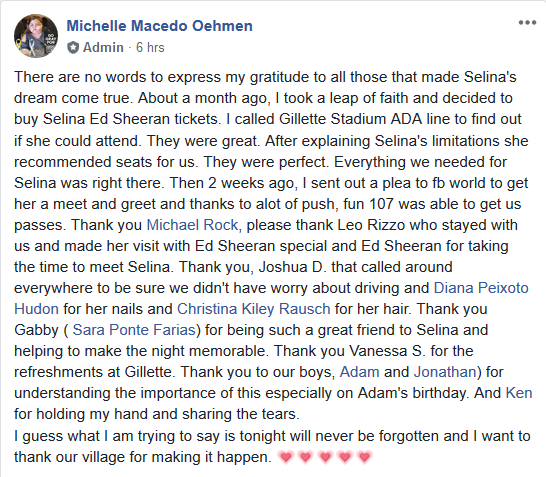 Michelle and Ken Oehman are thankful to all who made Selina’s dream a reality. It is important to remember through Selina’s special night that September is Childhood Cancer Awareness Month. Childhood cancer is the leading cause of death by disease in children under the age of 19 in the U.S. Less than 4% of federal funding directed toward cancer research goes toward solving children’s cancers. The Oehmen’s, and other family’s like them, are looking to bring more awareness. If you would like to keep up to date on Selina along with fundraising efforts to help the family’s expensive medical costs, you can go over to her Facebook page Selina Strong and sign up.